What is eBiz portal - How to Use eBiz Portal? www.ebiz.gov.in - Do you have any idea about e-biz portal? It is one of the incorporated services projects. eBiz is part of the 27 MMPs (Mission Mode Projects) under the national E-governance Plan of the government of India. What are the benefits of e-Biz Portal? What exactly e-Biz portal is? The answers of these questions are given below. What is eBiz portal - Benefits of eBiz Portal? The union government has commenced a single window government to business (G2B) portal for 11 central government services. It is instigated to bring transparency and easiness of doing business all over the country. Moreover, it is provided to facilitate quicker clearances for all businesses. Below are the advantages and key facts of eBiz portal. eBiz is government’s initiative intended to improve India’s ranking in effortlessness of doing business index. It will become possible by influencing technology to bring precision, promote expediency, and enhance effectiveness. It offers single platform for online submission. It will be helpful for processing of forms and online payment as well. Currently, government of India has decided 10 pilot states in which they are going to execute the plan and will develop later in other states of India. 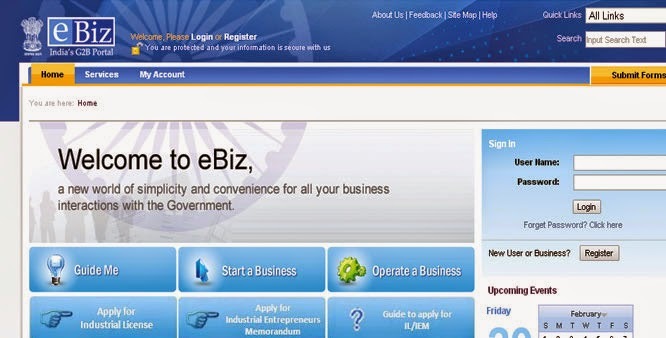 The eBiz portal will provide total 11 union government services to reach its purpose. Among 11 services, 4 services will be from MCA (Ministry of Corporate Affairs). It will include name availability, director identification number (DIN), and certificate of incorporation and commencement of business. Two services will be from Central Board of Direct Taxes (CBDT) and it will provide permanent account number (PAN) and TAN (Tax-deduction Account Number). Two services will be provided from Reserve Bank of India (RBI) to abridge the procedure like foreign partnership through general authorization route from Reserve Bank of India. 1 service will be from directorate general of foreign trade, 1 from employees provident fund organization, and last 1 service will be from petroleum and explosives safety organization. The portal will provide all businesses and investment related clearances 24x7 with the included payment gateway. The 11 services will be given and there will be a great result of eBiz portal all over India and world as well.